I am always looking for recipes that save me time, are convenient, and can be prepped ahead of time. I work 40 hrs a week outside the home, so any time I can save making dinner is a huge plus for me. 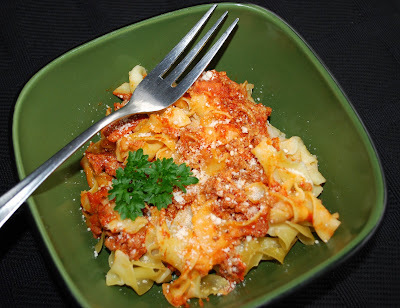 I had seen several recipes for lots of different kinds of crock pot lasagnas, but none of them really did it for me so I decided to come up with my own. I gave it my own little twists and came up with a brand new recipe. I decided to give it try over the weekend so I could see if it was something that might make a tasty and fast weeknight dinner. Many of the recipes I found contained no garlic (or spices)! Blasphemy! If you hadn’t noticed, I tend to add garlic to lots of my recipes. On the rare occasion that I meet someone who says they don’t like garlic I always turn into the aunt from My Big Fat Greek Wedding. “You don’t eat no GARLIC??? What you mean you don’t eat no garlic?” “You come to my house I feed you garlic.” Yeah I know it was meat in the movie but you get the idea. Luckily for me my Mom watches the boys after school, so this would be a doable weeknight dinner for me if I put it all together the night before, then my Mom could turn the crock-pot on for me and it would be ready when I got home from work. In a large skillet cook ground beef and onions until done. Add about 1 tablespoon of Italian seasoning, or just shake it in there till it looks good. Add the garlic in a few minutes before the meat is done. Drain out any excess grease and stir in the sauce and pepperoni. Grease the crock-pot. Spread 1/3 of the meat on the bottom then cover with a layer of noodles then cheese. Repeat the layers twice. You should end up with a layer of noodles at the top. Sprinkle it with the last of the mozzarella cheese and cover. Cook on low heat for 3 – 4 hours, or until heated through and cheeses are melted. Note* I pre-cook the pepperoni on some paper towel in the microwave, just 30 seconds or so to get most of the grease out. I placed 25 slices of pepperoni on a triple layer of paper towel. Don’t overcook it; just check your microwave at about 30 seconds. Repeat with another 25 more slices of pepperoni. Chop and add to mixture. This was fantastic. We had Mitch and our neighbor Belle over and everyone loved it. I was worried that it would get too mushy, but it didn't. I was worried the pepperoni flavor would overpower the dish...it didn't. It almost tastes like a cross between baked ziti and lasagna. I used ground turkey this time, didn't tell anyone, and not one of them asked. This is a keeper for sure. One last thing. The photo.......why are pasta dishes so hard to photograph? They always look like a big pile of mush. It was a pile of mush that tasted great though! Nice, convenient and comforting Italian-American lasagne! This sounds wonderful... I am going to have to give it a try! I made this at the beach for a big family dinner and it got rave reviews, even with some mishaps (I blogged about that) -- so easy to get distracted at the beach. I think it will make a reappearance during football season too.